That’s thirteen elementary schools by my count. Let’s assume that the consultants are right and that the schools need to be closed. In that case a lot of students are going to have to travel further to get to school. As I recall Texas requires the district to provide bus transportation for all children that live two miles or more from their assigned school. We see nothing in the financial workups that show the increased cost in busses, drivers, and fuel. This entry was posted on Tuesday, July 19th, 2016 at 4:00 AM and is filed under El Paso Independent School District. You can follow any responses to this entry through the RSS 2.0 feed. You can leave a response, or trackback from your own site. Burnet had a great year recently on their testing scores. Why close a good school down?? I went there as a child and it was a great neighborhood school for many years. So many of these are questionable and maybe politically or otherwise motivated. Pretty much everything in El Taxo is “politically motivated”. The John Cook, Foster, City Council baseball field, TAXES, who gets city, county contracts, who Don’t., who gets “selected” for city, county, Public Official jobs, positions, “Qualified” just means that “you” know somebody. City Council going to blow off more than $250,000 for Christmas lights at the new San Jacinto park, that has NEW lights. Wonder who gets that contract? And yet El Pasoans have to deal with foot-deep chug holes all over town, street stripes, markings that became invisable months, years ago, a safety hazard. A Police Department undermanned, driving JUNK cars. Where does OUR TAX money go? quarter-MILLION in Christmas lights, really? As evidenced by FBI cases, Lorenzo Garcia, EPISD, School Boards, JUDGES, Council people, other Public Officials, Public CORRUPTION is inherent in El Taxo politicians, Public Officials. That is just how it is here. Numerous schools closing because of a LOT LESS students and yet it all cost MORE. Property Value evaluations, RE-evaluations, always followed by MORE tax INCREASES on the home owners of El Taxo. ONLY home owners should be ALLOWED to vote on ANY school Bonds. They are the ones who suffer the free-spending, tax, waste, spend tax some more by the School Boards, Public Officials and politicians. But then the entire city, county government of El Taxo is all the same. THEY have no idea where all the money comes from that THEY tax, waste, spend and tax some more. Not totally correct. If you rent an apartment, the landlord pays property taxes on the apartment complex and the landlord factors those taxes into the price you pay to rent the apartment. Really? And there is a line item on your rental agreement that shows that you pay “this much” in the property owners property taxes? A bit of a stretch there. You pay the RENT to the property owner. Whether he pays taxes, water bill, electric bill from EVERYBODY’S RENT or goes out and buys a boat, is entirely up to HIM. Easy answer to the question. Look on the Property Tax Rolls of TAXPAYERS and see if you are listed, how much you pay?. In Fall 2015, Beall Elementary had 442 students, Douglass 389, and Zavala 263. Texas education achievement indicators placed Beall and Douglass at the very bottom of state elementary schools, with Zavala near the top. Built in 1927, Zavala is located next to the busy, polluted intersection of 54 and Paisano where 110 enters Mexico. Built in 1962 and with a recently renovated gymnasium/meeting facility, Beall has almost twice as many students as Zavala. Yet the Facilities Advisory Committee accepted staff recommendations to close Beall and to invest $11 million in renovating Zavala. Most Beall parents and students (grades K-5) will have to walk 2-3 miles to attend Zavala. When school boundaries change, more than 100 other Beall students will go to Douglass, built in 1920, which did not receive renovation funds. Beall and Douglass students continue to Guillen Middle School and Bowie High School. Children from Zavala have a different feeder pattern to Henderson Middle School and Jefferson High School. The consulting architect said that Beall should close because it has only 2 acres of land and Zavala has 6.5 acres. Yet when the Mesita Elementary community and teachers insisted that more space was needed for their campus renovation, the School Board quickly agreed to purchase adjoining land. Similar action would make possible the renovation and retention of Beall. In addition, no bond funds are proposed for renovation of Guillen Middle School or Bowie High School. 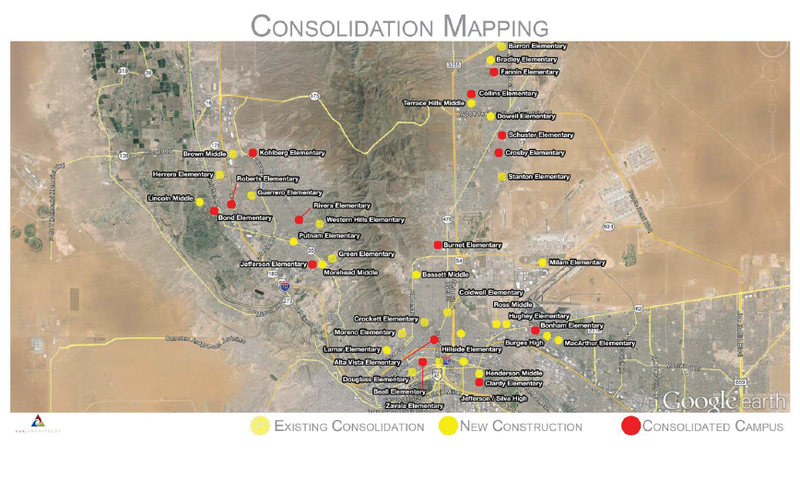 Thus, another El Paso community long neglected by EPISD, the Chamizal/South Central region, will be passed over again. Parents and community members have struggled since the 1970s to maintain and improve their neighborhoods south of IH 10. Their major priority is a quality education for the children of Chamizal. Sally, your points are well taken. In the last few bonds, little was invested in Austin HS as well. It does make you wonder when 70 million is set aside for Coronado HS. It would be nice to have a clear plan (discussed with the public) for these schools, then invest in the academic facilities to be used going forward. Investing in Jefferson’s football stadium doesn’t seem to be the highest priority for either the Jefferson or the Bowie feeder pattern. Don’t be silly. We’ll just pass another Bond to pay for the transportation.